This is a cherry step-back cupboard in two sections, having wine glass racks and true divided light doors in upper case. The lower case has raised panel doors and 3 drawers. Here is a curly maple cabinet made for a large t.v. and electronic components, having a shaker influence. The cabinet has lip drawers, and raised panel doors with hand turned knobs, and rests on a simple baseboard. 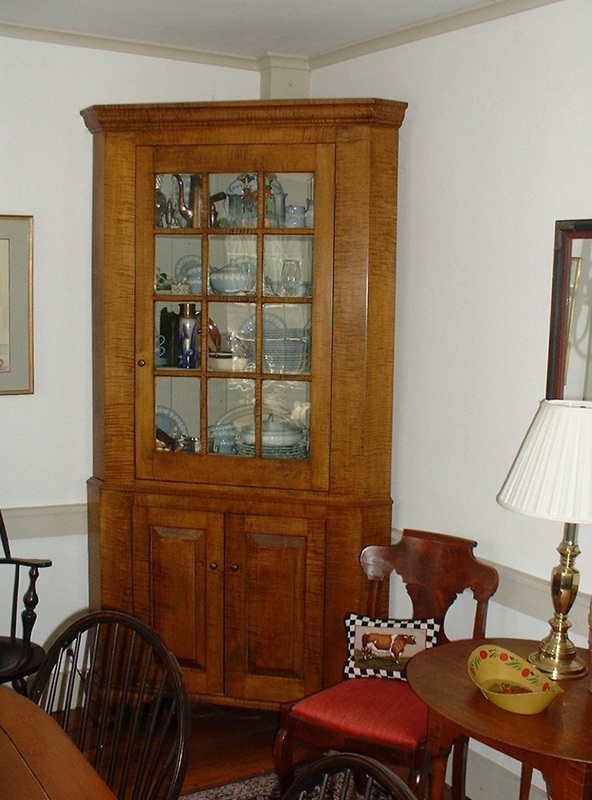 This classic tiger maple corner cupboard has a true divided light door in the upper section, and raised panel doors in the lower case. The moldings are handmade of tiger maple. A federal style bookcase in 4 sections. The central upper case has true divided light doors. This cherry bookcase was custom made for a mountain retreat. It has by now undoubtedly darkened to a wonderful nut brown color.